Every day, Honey tends her garden, thinning the lettuces, pulling up beets, and even singing to the kale. (Honey says if you listen carefully, you can hear the kale singing back!) Laurel, the little girl who lives next door, likes to help, weeding the rows, washing vegetables under the pump, and gathering speckled eggs from the chicken coop. But one day there is a FOR SALE sign in Honey’s front yard. Honey’s mother is sick, and she is moving away! What will happen to Honey’s garden? And what will Laurel do without her friend? 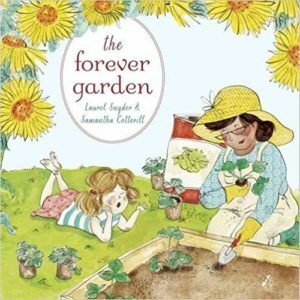 Here is a touching story that beautifully illustrates how friendship—just like a garden—grows.